It’s National Prime Rib Day, which I think should be every day (or at least alternated with National Bacon Day)! I used to think prime rib was only for eating out. I’ve had some very, very good prime rib at restaurants. It always seems so special because many restaurants only serve it on certain days. I thought it must be very complicated to prepare. I’ve even had those utterly disappointing moments when I was told that the restaurant was out of prime rib for the night. So sad. 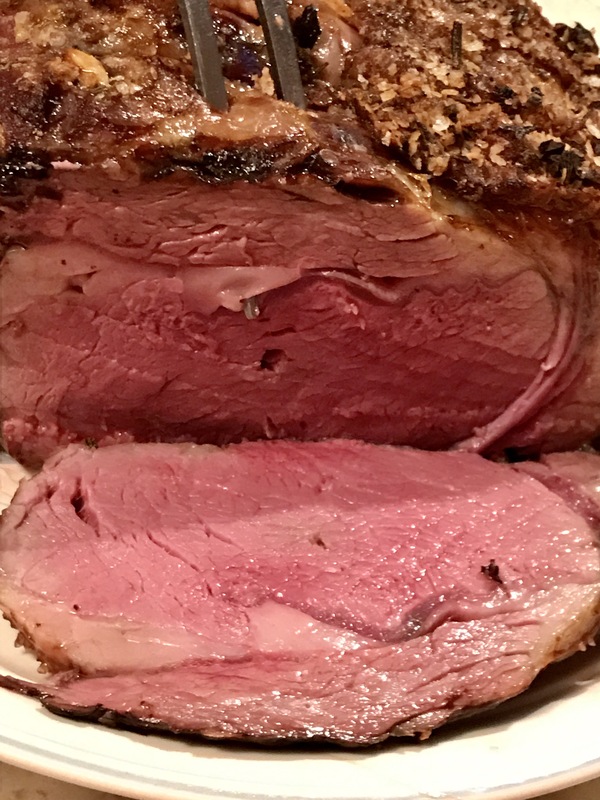 Here’s the thing, prime rib is simple to prepare, and it is considerably less expensive than ordering it at a restaurant. Oh, and you can eat as many slices as you want! The first thing you will want to consider is how large of a roast you need. How many people will you be serving? You should have about one pound per person. You can also look at it this way, each rib serves 2-3 people. A roast is at least two ribs, typically 3-7 ribs. One rib isn’t even a roast, just a really big steak. Don’t forget to go a little larger if you want leftovers. The next, very important, step is to have the butcher cut the roast away from the ribs (it’s a task better left to the pro and will make it easier to carve when cooked). Have him leave it sitting on the ribs though to cook because the bones give flavor to the meat. The only other thought when purchasing the roast is the quality of the meat. Although Prime grade is typically restaurant level, you can chose to pay a little more but definitely go at least Choice. 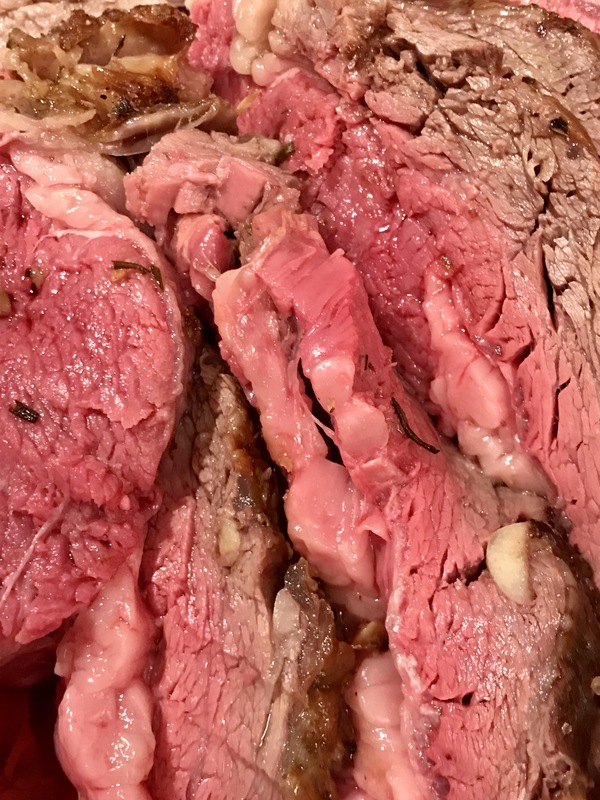 A rib roast should be flavorful of its own accord. It doesn’t require marinating, though I do like to compliment the meat with flavors I love: fresh garlic and rosemary. The next steps can get a bit controversial. To salt or not to salt?? I salt. Some people will say that the salt draws the moisture out of the meat. That is not my experience, but I also only cook my roast to rare-medium rare so it is naturally more juicy. Then, to sear or not to sear?? Searing is done by cooking the meat at a high temperature briefly. Searing puts a crust on the roast. I like the crust, hence the recipe name. I think the searing helps hold in some of the moisture too. I flavor the meat two ways. The first is by inserting cloves of garlic throughout slits in the roast. 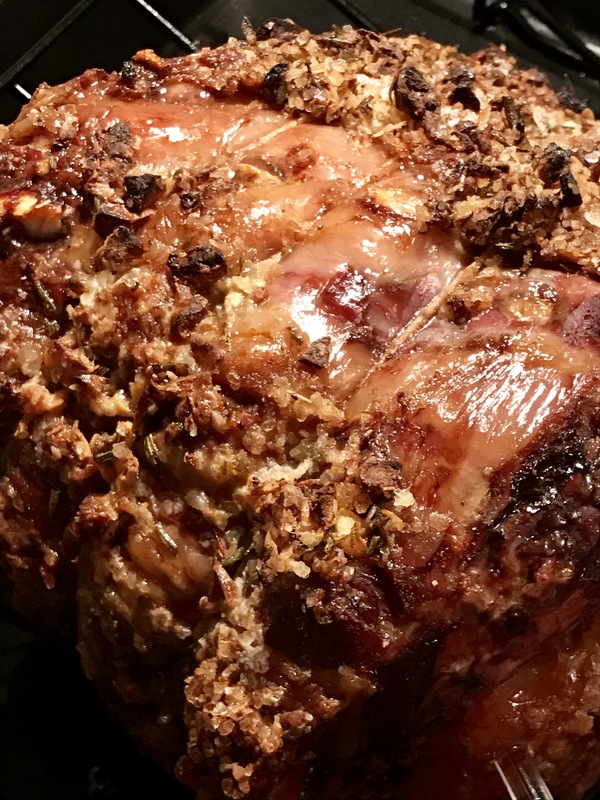 The second is a crust of chopped fresh rosemary, minced garlic, large granule sea salt, and crushed rainbow peppercorn rubbed all over the outside of the roast. Rare: 115 °F (46 °C). Medium rare: 130 °F (55 °C). Medium: 145 °F (63 °C). DO NOT go here or any more done! Seriously, if you don’t want pink, just eat chicken. Once the roast reaches the desired temperature, remove it from the oven and let it sit for about ten minutes before slicing to allow the juices the redistribute. Serve with the juice of the meat, au jus, and a little horseradish. You can make or purchase horseradish sauce, but I prefer fresh horseradish. A little goes a long way. Leftovers make great French dip sandwiches. It can also be sliced in strips for a salad. 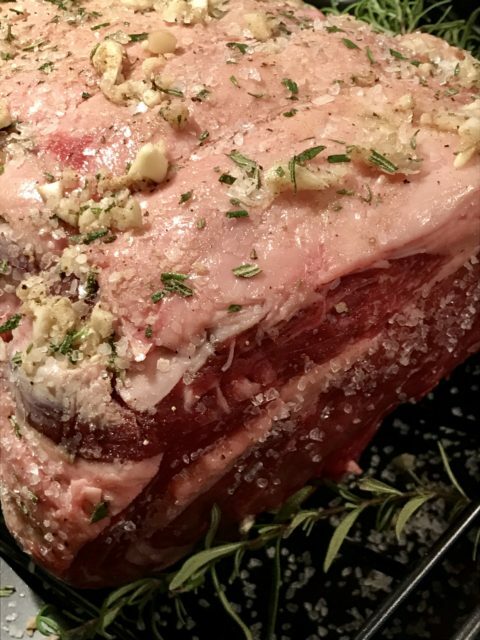 A tender, juicy and flavorful rib roast perfect for impressing guests.